It was hard to miss the “good riddance to 2016” trumpet blasts just two weeks ago. So 2017 starts off in a pretty good position with small shoes to fill. However, the expectations we as individuals have for our own achievements have not waned. Redo everything and improve it all. “Nothing is sacred” has been my mantra lately. Up takes effort. For you, let 2017 be the year you say you got better every day. The year you surrounded yourself with smart people. The year you got a hold of better data. The year you made more informed decisions. 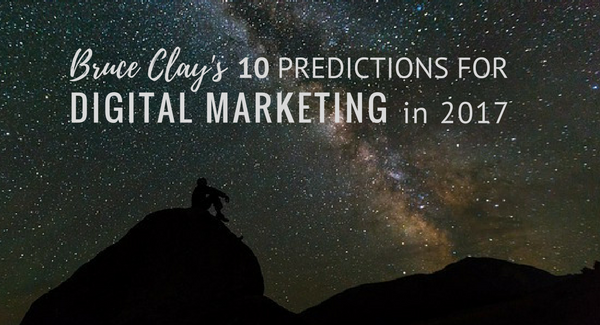 In that spirit, I perform my annual exercise of crystal ball gazing, offering predictions for the search marketing and affiliated digital marketing spaces for the year to come. Why have I done this every year for the last 12 years? Everything we do is done in service of this primary goal: Get more traffic to websites. To get more web traffic, we have to know what works and what will change — and the sooner the better. With a digital marketing road map clearly drawn, we can gain a competitive edge by innovating strategies around upcoming opportunities. So the predictions below are the starting point for a conversation about how search marketing is evolving to be smarter over the next few months. Give them a read and let me know what you think. 1. The SEO world will be shocked to see that organic listings will shrink as PPC and Local Paid Inclusion takes hold. Google will become a pay-to-play space with only the top few organic rankings getting continual search traffic, usually for information-centric sites. 2. Mobile will significantly dominate the traffic on the web. In the early part of the year, desktop search will fall as a percentage of total queries. Later in 2017, desktop search will gain search traffic share as an information portal as mobile search tests a totally paid model. 3. Voice search will exceed half of all searches, and find increasingly common use for desktop search. This will totally flip the concept of keywords as people speak what they want instead of typing it. 4. AMP (Accelerated Mobile Pages) is here and will likely remain, but it will not be a very successful project. There are several other and more attractive solutions that will gain a foothold … Your website as an app? Yes, definitely. 5. PPC will grow exponentially. When the entire first screen is paid ads you become a believer. We advise ourselves and clients that they need to follow the money … How does Google make money? Certainly not from organic listings. 6. Shopping on Instagram, Instagram storefronts and affiliate programs take hold. The online fashion industry is many billions of dollars, and visuals rule. Look for massive growth in the area of Instagram shopping. 7. Ads on social media continue to grow, not without challenges. Social is rejected by users as an inappropriate channel for ads. While highly targeted social ads are great for the success of advertisers, users will have the final say. 8. We will see new forms of behavior around virtual social rooms. Social media users and platforms innovate new means of social engagement instead of meeting people in person. Virtual reality (VR) chat rooms become a new social experience. 9. Content is going to be a significant SEO focus, driving most projects throughout the year. This is an easy prediction to make. The key is that the quality of the content will be judged by RankBrain, and so content for content’s sake will not prevail. 10. New tools will help content marketers produce targeted, high-quality content at the time of publishing. Content writers demand more data and become more technically bold as easy-to-use tools provide traffic and competitor SEO stats, ushering in a new generation of targeted high-quality content. How should these changes affect your digital strategy this year? That’s where my 2017 resolution kicks in. I’ve committed to blogging every week, and you can bet these predictions will be a catalyst for many posts to come. 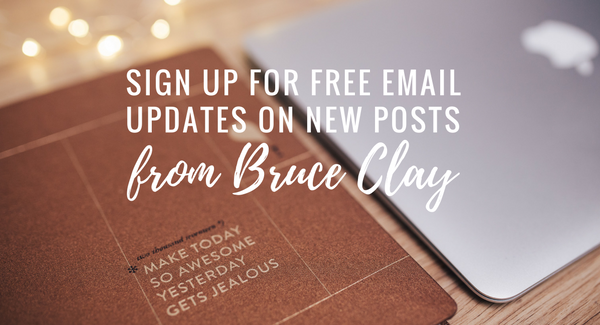 Follow along with me by signing up for free email updates for the blog. It’s always an honor to answer your toughest digital marketing and SEO questions. Let me know of any topics you’d like me to cover here. Fun fact: 2012 was the one time I took a formal poll to rate how I did on my predictions one year out. I scored a 58%. As for these predictions, how do you think I did? Let me know in the comments. Hi Bruce, your 5th reason should make so many of us reconsider our strategy as you are correct Google makes money from paid listings not organic listings. thanks for the continual reminders for our business. Hi Bruce, excellent list of prediction especially the virtual reality concept growing vastly and certainly will play a major role in digital marketing. I am applying these prediction on my marketing strategies, awesome information sharing thank you so much. Excellent post. There’s quite a lot going on in the marketing world and it sometimes hard to keep up. I think that another interesting trend is marketing automation. A lot of small businesses start using it because some service providers, like GetResponse, make it more affordable. if it happens, what will do all SEO experts? are there still space to play with Google? does it mean, that all content marketing will have to be informative? Awesome information sharing thank you so much. Since the mobile is now the primary device to browse the web, we should all focus on Mobile Marketing. We have also stated working on our mobile apps to give personalized experience & improving our Mobile Websites. Great Blog Share, I am applying these predictions for my marketing strategies. Thanks Bruce, insightful as usual. Not sure how big G’s rank brain will factor in a “page 1 PPC” world with CTR as a voting system, while maintaining quality. It sure sounds like a doomed approach as users vote with their clicks while advertisers bid with $$’s not quality. What is your thoughts on the ‘baking into core algorithm’ approach from big G? Sure wish Matt was still there! The SEO world made so much more sense with the “cookie guy”. I will be interested to see if prediction #1 becomes true. Reputation as a quality search engine is what makes Google a virtual monopoly in many countries. I wonder if they would risk harming that reputation by becoming a paid ads engine – with “deserving” organic websites requiring extra effort to reach. There must be a balance between greed and killing the golden goose. If Bing did the same thing at the same time that would be interesting too. Do you think that will happen? Great List, I hope so much, that VR gets more support in 2017! All those above predictions are awesome & perfect, Which is I thought too. Especially point five, It says the exact thing that SEM will raise than the organic results on 1st page of google. Mostly it will ride on mobile searches, And my question is, Do SEO will survive in 2017? I believe your paid search predictions are spot on.Money has to be a factor in the Google business model and they are an advertising agency so all these pages in search littered with paid ads make perfect sense from both financial and search point of view what does the customer searching care if it’s organic or paid as long as the result is good. I like your prediction for VR chat rooms. I can imagine my son’s sneaking upon me during our paintball game set in an ancient jungle with dinosaurs ;-) That will become the ultimate social experience. To your question about the various high-speed solutions (AMP, Instant Articles and the like), JUHLi, it’s a great question and Bruce plans to cover it in an upcoming post. Thanks for adding the point about live streaming video. I’m sure Stelzner and Fanzo are right about it being a crucial brand marketing play in the upcoming months. I’m tuning into live streamed videos more, and it’s interesting to see where brands fit on each live streaming platform, some more naturally in an organic content way than others, some allowing for ads more elegantly. This is an excellent list of predictions Bruce! I appreciate your insights. I think you’re bang on with Instagram for 2017 (I work with a fashion brand). I was surprised you didn’t mention anything about live streaming video in this list. I wanted to add that I listened to a Social Media Examiner podcast interview with Michael Stelzner & Brian Fanzo about live video in social media – Brian said live video is the gateway or stepping stone to virtual reality for brand marketing, and that brands that get good at live video will have an advantage when it comes to VR in the future. Do you have any thoughts about video in general or live video for 2017? One more question – I have wondered about optimizing for Google AMP vs. Facebook Instant Articles – and I read the article you have linked to here regarding your website as an app. The article didn’t mention how this compares to responsive websites – are you saying responsive sites won’t cut it any longer? And what do you think of Facebook Instant Articles? Can you optimize for both?